Now that you have a clean slate to work off, let’s rename some classes. I find Xcode’s default naming scheme a bit silly, with the way it prepends the project name to each file. I think the Application Delegate should be called, simply, AppDelegate.m instead of the needlessly long TwitterXMLAppDelegate.m. However, you can’t just rename the file to whatever your preference is, as that would break things. You can rename a class project-wide, file and all, by using the Refactoring tool. You can call it up by right-clicking on the class name in the implementation file and choosing “Refactoring” from the resulting menu. This renaming business is entirely optional as far as this tutorial goes, but it’s worth know how to do. Imagine if you made a typo in a class name and didn’t realize it until after you had already referenced it in a few places. It’s nice to have an automated fix. 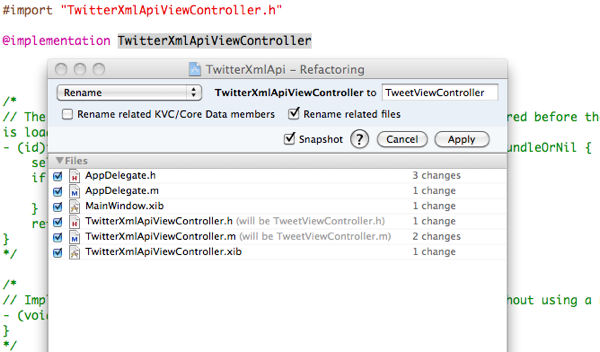 Most of our code is going to go in the View controller, named TweetViewController in my case. Switch to the corresponding .h file and we can start setting up properties and whatnot. Now we need to declare some variables and other objects in the interface block. We need a string to hold the name of the Twitter user whose profile we will be accessing, a mutable array to hold the statuses we’ve pulled from the parser and a few that are used to hold data temporarily during the parsing process. Also, we need a few IBOutlets so we can update the View once we finish reading the XML data. Of course, we need to make these objects into properties. This means adding a few property declarations after the interface block ends. Now that that’s out of the way, we can get to the interesting part. The first method in the View controller is <em>viewDidLoad</em>, which fires as soon as the View as loaded. (Subtle, isn’t it?) We will be putting our initialization stuff in there. Basically, we just need to ready our properties, set the Twitter username and start the parser. After the first arrays and dictionaries are initialized, the twitterUser string is set to the username of the Twitter account we want the app to pull the latest statuses from. I’m using Collis, one of the co-founders of Envato, as an example. You could put any user you want there, so long as they have a cool-looking background on their profile! The last line calls the parseXMLForUser: method and passes the twitterUser string along with it. We will work on that part next. The parseXMLForUser: method is responsible for setting up the parser, as well as building the Twitter API URL. The first part of the method should look familiar to anyone who has worked with C or Java before. It takes our user argument (which contains the text of twitterUser) and splices it into the URL string, just before the .xml part. Cocoa expects URLs to be of the NSURL object type, we create a new one of those and pass it urlString. After that is done, we create a new instance of the NSXMLParser class and nickname it “parser.” We also pass it the new URL object, which it will use to download the contents it finds there at runtime. Next we set the parser’s delegate to self, or the current class. The next three lines turn off some features we don’t really need. Finally, we kick the parser into action and leave a [parser release] command to clean up after it’s done. That was simple, wasn’t it? Sadly, that was only the beginning. In order for the parser to, well, parse we still need to implement the delegate methods for NSXMLParser. And we need to make a spiffy UI. NSXMLParser is what is called an event-based parser. This means it loops around, searching a document for anything that looks like an XML tag. When it finds one, it raises an event. Basically it says “I found an opening tag named ‘something'” and leaves you to deal with it. The parser does the same thing with ending tags and the text between them. We have to implement delegate methods to handle these events and save the data they find. Let’s start with a couple of simple ones. Moving on, we have a method that is called when the parser finds an opening XML tag. //Store the name of the element currently being parsed. This one is a bit more complicated. When it’s called, its arguments are populated with information that the parser found out about the element currently being parsed. It’s name is what we care about, primarily. Using the properties we created earlier, the method keeps track of the element currently being parsed (we need to know its name in other methods) and whatever is inside the element (between the opening and closing tag). The conditional statement at the end empties our dictionary every time the parser moves on to a new <status> element, as we will have already copied its contents to the statuses array. The next delegate method takes any characters found inside an XML element and stores it in the currentElementString property for later. And finally, the penultimate method. This one contains the real meat of the parser. It is called whenever NSXMLParser comes across a closing XML tag. And so, it serves as a good place to put most of the data-saving logic. The first code chunk saves the contents of the currentElementData dictionary to the statuses array if, and only if, the ending tag being processed currently is </status>. If you remember from before, currentElementData will be emptied the next time the didStartElement method is called. Otherwise, the block will be skipped and the application will handle the tasks it needs to run for child elements of <status>. After stripping out extraneous spaces and newline characters from either side of currentElementString, so we don’t end up with weird output, we have a rather long if/else if block. This checks whether the element being parsed is one we want to save (e.g. “text” or “profile_image_url”) and if it is, it adds it to the element data dictionary. The code may seem a bit strange at first, but it should make more sense after you become more familiar with it. And now, for the last delegate method. This one fires when the document has finished parsing. This is the place to launch any operations we want to be started after we have our data. As you can see below, logging the statuses array to the console and then calling a method to display that data is what we will be doing here. //Document has been parsed. It's time to fire some new methods off! After all that code, let’s work on the interface. Double-click the TweetViewController.xib file (or whatever your View XIB is called) in the Xcode sidebar to open it in Interface Builder. Now that your screen is sufficiently cluttered with windows, you want to drag a UIImageView from the Library window into your View canvas. Make sure that it is sized to fit the whole available area. 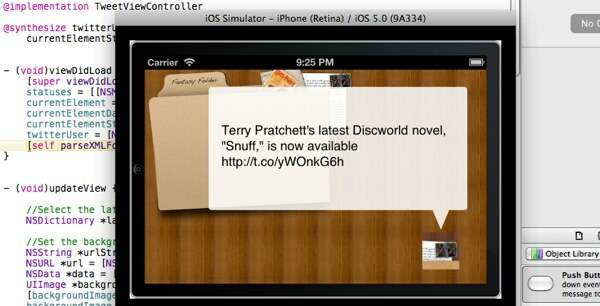 Of course, the Image View won’t be much use to us unless we link it with the controller. Right-click on the File’s Owner icon and drag the little rubberband/wire thing from the backgroundImage Outlet over to the UIImageView and drop it. The File’s Owner overlay window should update to show the Image View as being connected to backgroundImage. I think this app would be better if it used a horizontal orientation, don’t you? Click the little arrow icon in the upper right corner of the View canvas. Interface Builder should automagically resize the Image View inside it to still fill the View. Save the XIB file out and switch back to Xcode. Now we have to configure the application to use a landscape orientation instead of the default portrait one. Back in Interface Builder, drop in a new UIImageView. We won’t be hooking this one up to an IBOutlet. Instead, we will set the image to the word bubble image I made (it’s in the project file), resize the view to be the same point-width as the image (375×208) and position it neatly over the background image view. I also lowered the opacity a bit, just because I liked the effect. Now we need a way to display the contents of the latest tweet. 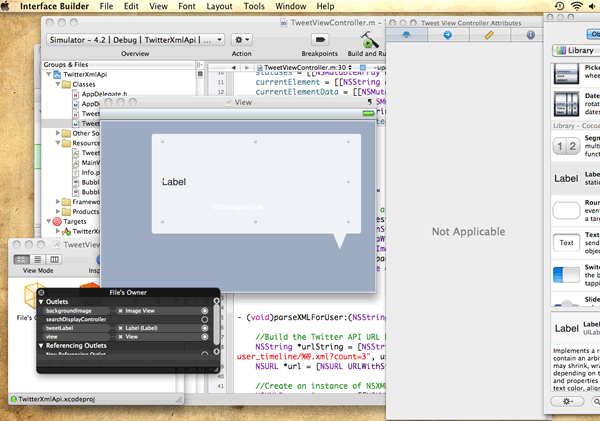 So drag a UILabel onto the View canvas and resize it to fit nicely over the word bubble graphic. Turn the “# Lines” setting up to five or so, set the font size to something that looks legible and change the “Line Breaks” option to “Word Wrap. 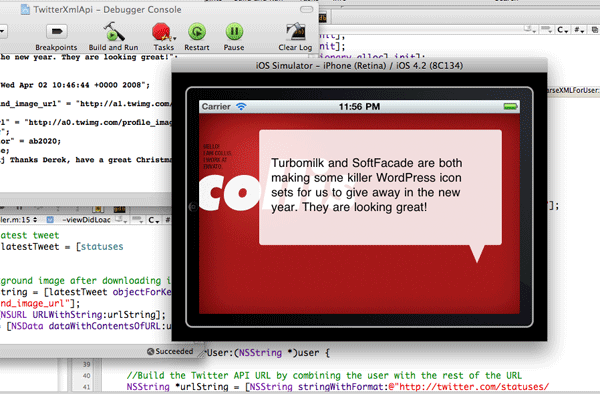 Then wire it up to the tweetLabel IBOutlet, like you did with the UIImageView. Ready to tie everything together? 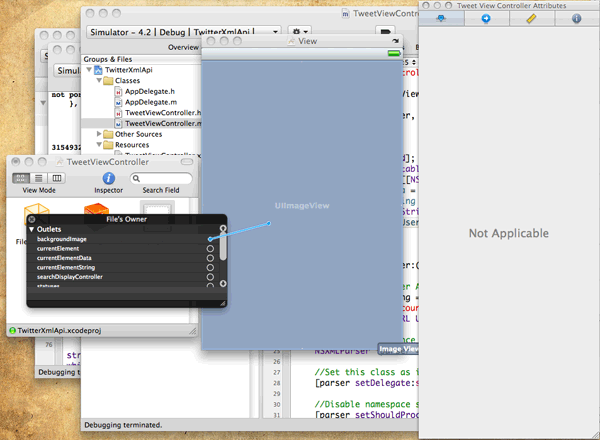 Switch back to Xcode and add one last method to the controller class. //Set the background image after downloading it. While it looks nearly as intimidating as the NSXMLParser didEndElement delegate method, it’s actually quite a bit simpler. The first line gets the newest tweet from the statuses array, the =[tweetLabel setText:…]= line updates the UILabel with the text of the message, and the last part changes the background image behind the word bubble to be the same as the Twitter user’s profile background. That last part needs the most explanation. Before we can display the image (which is what the setImage line does) we have to download it first. Taking the urlString, which of course is a string containing the web address where the image can be found, we convert it to a NSURL object, which is named url. We create a new NSData object and use it’s dataWithContentsOfURL method to download the image. (Cocoa requires that URLs used with it’s objects be of the NSURL class.) Next we initialize a UIImage object with the NSData object and set it as the image in the UIImageView named backgroundImage. 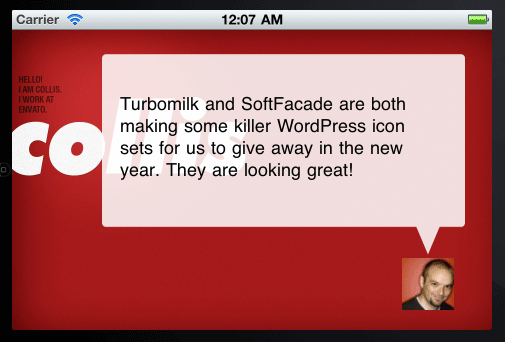 Oh, and we set the content mode to UIViewContentModeScaleAspectFill so it’s not squished funny. Before we free up our allocated memory and finish the app up, let’s add one more thing: an avatar field! Switch back to Interface Builder and add a new UIImageView. Resize it to 52×52 or so and wire it up to the “avatar” IBOutlet. Re-using the code from the background image bit, we can quickly modify it for the avatar. //Set the avatar image after downloading it. That goes in the updateView method, after everything else. Now, before we can say the application is finished, there is one thing that needs to be done. Any memory we specifically allocated should be released. It’s not a huge deal in a single-view app, as it will be forcefully freed up on exit, but it’s a good habit to get into. (In more complicated applications, you can expect to see frequent crashes if you don’t release objects when you’re done with them.) It’s easy to do. For every object we explicitely alloc or retain, we have to release somewhere. The dealloc method is called when the application quits in this case, so we put most of our release statements there. You can learn more about iOS memory management in this screencast. Want to add to this sample application? Try making the following change: Use an NSTimer to cycle through the items in the statuses array and update the View accordingly. Most of the groundwork has been laid for you already. Is there a way to use this same technique to show a users entire string of tweets, instead of just the newest one? 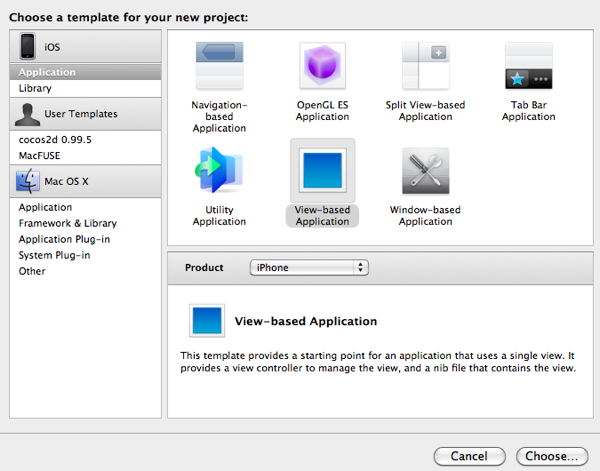 You could mash this tutorial up with a UITableView tutorial and display a full list. I can email you a screenshot of xcode if that would help. I don’t know if a screenshot would help much, as there are numerous places something could be wrong. (It’s difficult enough for me to debug my own projects when it’s right in front of me!) You could post one (or copy/paste to a pastebin site) if you want to give it a shot, though. Are the messages errors or warnings? (Red vs Yellow.) The compiler will sometimes throw a warning along those lines when the method being called is defined lower down in the code, but it should still compile and run correctly. If they’re errors, then you probably have some sort of error with the definitions. Maybe a typo or a missing brace somewhere. They are both errors, and I will check for typos and such, but I literally copy/pasted the code from above. I will look however. That is my screenshot of one of the errors. Okay. I noticed that the sidebar calls the error an “Automatic Reference Counting Issue.” I wrote this tutorial (but didn’t publish it) before Apple introduced ARC, and I haven’t really brushed up on the subject yet. If you’ve already figured out the basic idea, and are debugging, you could always ask the amazing people at Stack Overflow. Just include some of the code, and any errors it might be throwing. Someone usually responds quickly, and a lot of people who know more about embedded programming than me hang out there. The problem is that I get a sigabrt error at the objectAtIndex:0. So statuses doesn’t get filled. Which seems unlogical as the atom should be parsed without a problem as well with your method (I thought). Any idea’s? Is there any other console output? Does that NSLog(@"%@", statuses); in parserDidEndDocument show anything? Of course, you could always try using the JSON format instead. It’s quite a nice format to work with. There’s a good Twitter tutorial over at Mobile Tuts that uses JSON. p.s. your edit button doesn’t seem to load properly, so I can’t edit it.